Fariba Abedin, "Perception #87, 88, 89," acrylic on wood panel, 82 x 82"
Fariba Abedin's paintings light up a room with their bright colors and complex geometric patterns. Drawing on her Iranian heritage, the Houston-based artist is influenced by the intricate tiling and Arabic calligraphy used in Islamic architecture. Some of the motifs she favors include a square rotated 45 degrees within a larger square, polyptychs and multiple triangles arranged to form stars or prism-like patterns. Although some of her pieces are executed in black and white, she seems most intrigued by color, which has led her to study color-field artists such as Barnett Newman, Frank Stella and Kenneth Noland. Paintings like “Color Field #114” and “Color Wheel #11” reveal the influence of that mid-20th century movement on Abedin’s work. 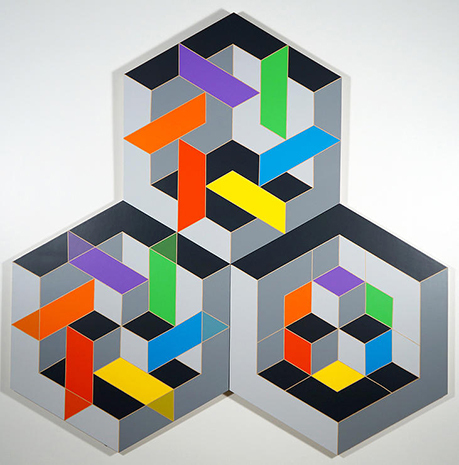 Many of her geometric arrangements create the illusion of volume: “Perception #87, 88, and 89” are three hexagon-shaped pieces composed of squares and rectangles executed in primary and secondary colors, as well as black and gray. The effect is architectural, with corner-like spaces that appear to contain stacked blocks and rotating stars. Paintings such as “Color Wheel #30” utilize layers of clear Plexiglas painted with bright stripes that seem to vibrate like Op Art. Other compositions are overlaid with the flowing curves of calligraphy, which is considered a visible expression of spirituality in Islam. Abedin also creates installation pieces inspired by the Persian poet Mawlana Rumi (1207-1273) who advocated tolerance, goodness, and awareness through love. In a small space curtained off for this show, the artist projects images of her paintings and Rumi’s poems, accompanied by recordings of Persian music and suspended elements that bring the walls to life. Trained as an architect, Abedin is well-versed in the elaborate mosaics and decorative patterns that characterize Byzantine mosaics, Moorish architecture, and other Islamic ornamentation. Although most of her paintings are acrylic on canvas or wood panel, the show also includes two calligraphic pieces, in which she uses copper to create a richly burnished surface, and a small bronze sculpture entitled “The One.” The entire show radiates the artist’s spiritual nature and optimistic attitude toward life.